Textiles are an important part of our lives. Be it the clothes we wear or the paper on which we write letters to our loved ones, textiles form an indispensable part of our daily routine. A textile is any kind of woven, knitted, knotted or tufted clothe, or a non-woven fabric (a cloth made of fibers that have been bonded into a fabric, e.g. felt). Textile has traditionally meant a woven fabric. The term comes from a Latin word taxere, meaning to weave. A textile is made from fiber or other extended linear materials such as thread or yarn. The various categories of textiles include woven, crochet, knitted, knotted or tufted coth, and non-woven fabrics such as felt. Materials such as fiberglass, which are made from fibers dispersed in a matrix of another material are called composite materials rather than textiles. The production of textiles is an ancient craft. The speed and scale of production has been changed beyond recognition by mass production and the introduction of modern manufacturing techniques. 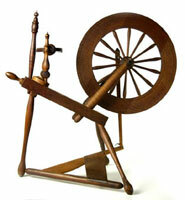 Many textiles have been in use for almost a millennium, while others use artificial fibers and are recent inventions. The range of fibers has increased in the last 100 years. The first synthetics were made in the 1920s and 1930s. Yarn, fabrics, and tools for spinning and weaving have been found from the relics of the early human habitations. Linen fabrics were discovered in Egypt around 5000 BC. Woolen textiles from the early Bronze Age in Scandinavia and Switzerland have also been found centuries ago. Cotton has been spun and woven in India since 3000 B.C., and silk has been woven in China since 1000 B.C. Around the 4th century A.D., Constantinople began to weave the raw silk imported from China. A century later silk culture extended to the Western countries, and the textile manufacture developed rapidly. By the 14th century, splendid fabrics were being woven on the handlooms of the Mediterranean countries in practically all the basic structures known to modern artisans, and since then there has been no change in the fundamental processes of textile manufacture, although methods and equipment have been radically altered.